It’s not rare that product manufacturers or packaging companies end up with a warehouse full of products or components that they are no longer able to sell. Sometimes it’s because of a product recall, a recent legal action or even a change in manufacturing standards. It’s important that companies have secure, cost-effective solutions for destroying these items. To protect their brand, trademark or copyright, companies should choose highly-qualified vendors for certified product destruction services. It’s a wise choice to keep branded items from ending up in the wrong hands and ruin the company’s reputation. Without destroying these products, there is a high risk for a brand-named business to falter. Sometimes these products can appear on the “grey market” and that would create increased liability, brand erosion, and millions in legal costs. It is necessary that companies procure a certified product destruction option to protect their brand identity. Certified product destruction is the process of destroying or disposing of these leftover products. Typically, these services ensure destruction of these leftover products so they will not be used illegally. For some companies, there are concerns over disposing of certain media products, like digital devices, films, or paper documents. These items should not be disposed of, they should be destroyed properly to avoid disclosure of confidential details or data. Electronic products usually contain embedded memory with quickly duplicated software. They should also be destroyed to protect your trademarked or patented designs from getting into the hands of your rivals. Whatever type of vendor you hire for the job, be sure they provide monitoring and protection throughout the whole destruction process. With valid proof of the destruction, they can guarantee that the products are indeed destroyed. Be sure to look for companies that provide the appropriate paperwork, including a certificate of destruction, as well as, photographic and/or video evidence of destruction. Trustworthiness – are there good references from previous clients? Are they experienced and licensed properly? Are they going to provide evidence of the entire destruction process? Does the facility have 24/7 surveillance for their storage area? Will they provide you with certification that the destruction has been completed properly? IntelliShred’s certified product destruction services have been helping customers destroy paper, floppy drives, CD’s and DVD’s, Video Cassettes, Microfilm, Microfiche and many more products. We provide a certificate of destruction, and a green solution for the disposal of your destroyed material. Our on-site team will come to your location to perform the destruction with our mobile trucks. Our trucks have all the necessary equipment and tools to efficiently and securely destroy or remove your items. Contact us today for more information on how we can provide certified product destruction services for your business. During almost every stage of business, companies collect personal, confidential or sensitive information. It’s the company’s responsibility to protect that information from the risk of identity theft and data breaches. Information security is essential, and failure to comply with new data protection regulations could result in numerous fines, and damage to your company’s reputation. Although there are strict regulations in place, to remain compliant, it’s best that companies contract with a third-party shredding and destruction company to collect and handle their confidential waste shredding. There’s an essential need for companies to protect confidential waste and sensitive data, because if it gets into the wrong hands, it could negatively impact your company. Using these services will not only protect your information, it will help your company reduce its impact on the environment. Today’s secure destruction services and shredding services are quite reliable – they must always perform according to the regulations which govern their process. Shredding stacks of documents with an office paper shredder is certainly not efficient or secure. A third-party confidential waste shredding and destruction service can us their industrial size shredders to shred all your documents into unreadable pieces. This process saves you time, because you won’t need your employees to stop what they’re doing and shred with a very small office shredder. Typically, an on-site shredding service destroys all confidential documents at the client’s site, in their state-of-the-art shredding truck according to regulatory procedures. 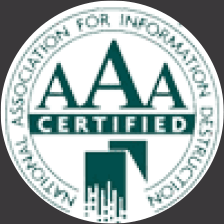 At the end of the on-site service, they provide a certificate to you for proof that the information has been destroyed. At IntelliShred, our team has quality experience in information security, legal, and regulatory industries which makes them highly effective. It’s our priority to make sure we provide you with an understanding of the shredding and destruction process. In turn, we will learn more about your business so we can create a turn-key solution and put policies in place for secure and confidential waste shredding. 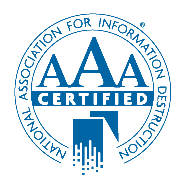 At IntelliShred, we’re proud to be an award-winning, fully-compliant service provider, according to the United States Privacy Act, the Safe Harbor Act and the Health Insurance Portability and Accountability Act. We offer our customers the most reliable, comprehensive services with along with the best technological tracking software. IntelliShred handles confidential waste shredding, digital media storage device and x-ray disposal for our customers. For more information on our services, please contact us right away. We can answer any questions you may have and easily provide you with a list of references.